No grand plans for us this year... Deacon has been fighting a little stomach bug today and yesterday and I just have no energy- so a relaxing day at home was a perfect way to bring in the new year. We thought maybe we would try to go to fireworks tonight at 9, but the thought of putting on clothes and going in public sounds about as appealing to me as a trip to the dentist... ok, maybe that's a touch extreme. We have been so incredibly fortunate in 2008... it's been an amazing year. So here's to a new year and new blessings. Well, technically the bike was for Damien... but we got it so he could take Milo on a more athletic walk. The first bike we got Damien broke on its inaugural ride so mom and I had to go back to the store and get a new one... and this one did much better. Milo had a great time and it wore both daddy and Milo out really quick! I'm at the fun part of the pregnancy where no sleeping position is comfortable and I'm peeing every hour. It's loads of fun. Oh, and no-name LOVES to play the most around 10 p.m. right as I'm getting ready for bed. I have made it a goal of mine to learn to use the sewing machine well... I hate that I rely on my mom and even my husband to do all the sewing in this house! After making jammies I gained a new level of confidence and the other day when we realized that my mom didn't have a stocking here at our house I decided to make her one! I took one of our stockings from downstairs to trace out a pattern and used some of the leftover jammie fabric... AND I DID THE WHOLE THING BY MYSELF!! !- ok, ok, Damien did the bobbin thing for me, but after he did that, he left and I did the rest with no one watching me!!! I swear I have never been more pleased with myself, LOL. We like being able to celebrate Grandma's birthday with her in person! 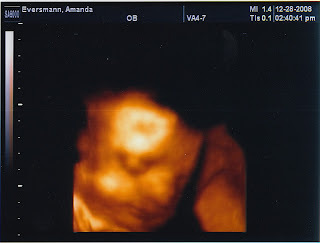 Today I had an ultrasound to check on my placenta and gallbladder. Good news first- placenta looks "great" (though the u/s tech said I didn't hear that from her... since the techs aren't allowed to talk about anything diagnostic). 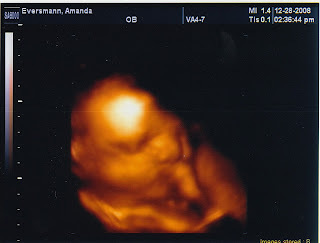 Baby was adorable as always- I never get tired of seeing that little alien looking thing in my stomach :) He's incredibly active... has been for over a month now- and today was no different. The tech had a good 20 minutes or so of him being good and still but then he woke up and she had to really work hard to get any good pictures of him. Baby no-name LOVES to kick me as hard as he can so it was rather entertaining to at least watch him do it and feel it at the same time. He's measuring right on time... another exciting bit of news for us since Deacon was always measuring about 3-4 weeks ahead. I'll be more than happy to give birth to a non-9 lb baby this time around. 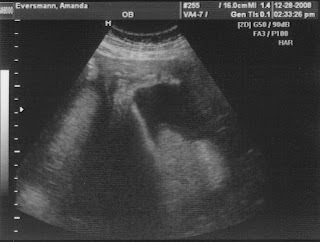 So in other news- my gallbladder. 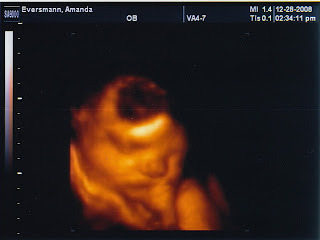 For this ultrasound she did a scan of my entire abdomen which was really interesting. 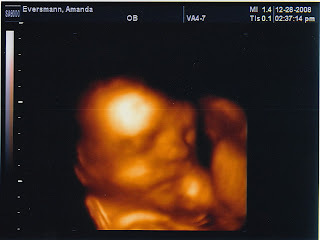 Well, she was much more quiet for this scan than she was for the ob scan... and then when she was taking pictures of my gallbladder she was REALLY quiet, LOL. The pictures of my gallbladder seemed weird to me and there appeared to me a big mass inside of it- but obviously I have no clue so I finally asked if what I was seeing was normal. Her response was that she wasn't allowed to tell me anything diagnostic, but a simple search on google would fill me in pretty quickly. LOL. Needless to say Dr. Google helped a lot and my u/s pictures look exactly like the pictures of everyone else who has a fair amount of gallstones. There isn't anything that they can really do at this point for gallstones. Thankfully I don't have attacks too frequently... in fact the last one I had was December 1. I found a blog of a woman who had a pretty bad gallbladder experience and she explained things really well here if you're interested in hearing what a gallbladder attack is like. I'm really hoping that things stay manageable for me... I'm due March 13, so a little less than 3 months to go!!! The baby still doesn't have a name and I'm more and more ok with that. I'm getting increasingly uncomfortable... I'm at that point in the pregnancy where I realize that I have quite some time to go but I'm really wishing it was 2 weeks away just so I wouldn't have to be pregnant anymore. I love feeling him move around, but most of the time he takes it to the extreme... he's very active and rarely sleeps. His kicking and movements are always really strong and rarely just a little flutter and he loves to get stuck really low in my belly and really high in my rib cage... either way I have a difficult time walking or functioning when he does it. I honestly can't complain too much though... I might be uncomfortable, but I'm healthy. I'm working out 3-4 days a week again and feel great about that. Baby loves when I'm at the gym and usually spends the entire time bouncing along with me on the elliptical or while I'm lifting weights- kicking as hard as he can when I put any pressure on him, LOL. We'll be doing the 3D u/s in the next few weeks and so I'll post some pictures of him then. We went over to Karla's house tonight and Santa stopped by for a visit! The kids LOVED it. Deacon was apprehensive at first and hid in the kitchen... he was all smiles and I think he hid because he was embarrassed that he was scared. But once I carried him in the room he was fine and loved it. Santa brought all the kids a present too- and even though Deacon asked Santa for an Incredible Hulk (which we knew he would) he got a Cars Mack Truck... and was SO excited.